I was a troubled and substance-abusing 20-year-old when I enrolled at SJSU. It was the care and support of my instructors and supervisors that allowed me to begin to develop in meaningful ways. Although my off-campus life was difficult, the learning and camaraderie with my peers made college fulfilling. I was able to complete both my degrees by working on campus through the work-study program and by counseling students in the Equal Opportunity Program. I found solace in helping other students. My education at SJSU turned the tides for me. I entered recovery in 1983 and have been clean and sober for more than 30 years now. My studies in clinical social work helped me understand myself and launch a successful career. I have been in private practice as a licensed clinical social worker since 1985. I specialize in working with individuals, families and adolescents with drugs and/or alcohol problems. It gives me hope and gratitude to be of service to others. It all began with my degrees from SJSU. What Happened to Tau Delta Phi? The Tau Delta Phi honor fraternity was a big deal on campus the years I was at SJSU (1962-1964). We occupied the Tower. We were the proud publishers of The Tower List, a compendium of student ratings of SJSU professors. We had an annual honors banquet. We even had a house, though I couldn’t begin to tell you where it was. However, at the time, I was married with two children, living in Santa Clara. So, I had little time for fraternity life. What happened to TDP? Here’s what I think: The Tower List was very popular with students, but a curse for the faculty. My memory is that the publishers of The Tower List were a bit on the radical side, and they let some pretty defamatory material get into the list. I remember that each year there were threats of lawsuits, some of which even made news in the San Jose Register and the San Francisco papers. Maybe someone stepped in and took the fraternity down a notch or two. Keep up the good work for the digital reading of WSQ. Thank you for providing both the beautifully printed addition of Washington Square and the option for many to enjoy the electronic edition. It has been over 40 years since I attended San Jose State, but I recognize regularly the influence to this day of my college life. The memories and the educational influences that faculty and fellow students have had on my career and life choices are immeasurable. I look forward to reading Washington Square with each issue, as I still occasionally recognize names from when I was a student. Your staff does an outstanding job. Happy for all the Spartan football players who got drafted into the NFL! Set us free from the Student Success Fee! #SJSU walkout against the university’s Orwellian “student success” fee. Maintain the connections you made in school with your friends, your peers, even your professors. They are your first professional network! Also, consider joining the San ‬Jose State University Alumni Association! The Alumni Association has a lot of great resources for new graduates, including opportunities to meet with potential employers. It’s also a great way to stay connected to the school. Be proud of your achievements! Bill Hauck, my friend of many decades, died recently from an aggressive form of brain cancer. While he passed from this earth peacefully and with dignity, he did not go without first putting up a quiet but determined and focused fight. That was so like him. A man of just enough words and more than enough character, Bill was one of the folks you wanted on your side, whatever the issue and whoever the adversary. We met in college, at San Jose State, in the early 1960s. Bill was student body president and the ultimate BMOC, and I was a lowly and quite unremarkable underclassman. Our initial link was my mother, who was a secretary in the Dean of Students office and therefore a person whom student leaders such as Bill interacted with regularly. She introduced us. Years later I recalled that introduction, but Bill didn’t, thus reminding me just how unremarkable I was. But there is no shame in remembering Bill Hauck on first impression. In recent years, we often found ourselves working on the same side on our shared passion for education reform, and on other endeavors to strengthen our civic institutions. I applauded his work on behalf of the California State University system, because of what it meant to our lives and continues to mean in the lives of hundreds of thousands of young people across the state. I admired his never-ending efforts to improve the processes and mechanisms by which California governs itself. In the end, I marveled at his determination, courage and spirit as he fought his last fight—another lesson, courtesy of Bill Hauck. Our final conversation—about a month ago—was not about cancer but, rather, about the CSU. That is fitting. Farewell, my friend, and job well done. From “Loss of a Public Citizen” by Les Francis. Read the complete story on Real Clear Politics. 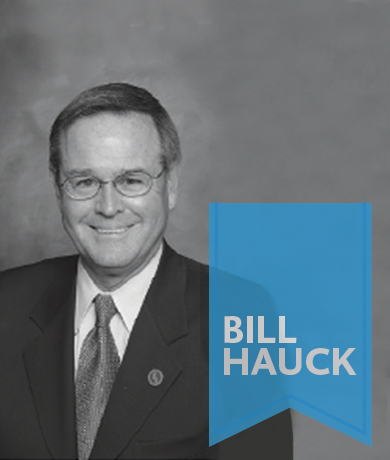 Bill Hauck,’63 Social Science, was the longest serving CSU trustee. He was awarded a posthumous honorary doctor of humane letters degree at SJSU’s 2014 Commencement. Washington Square welcomes letters to the editor regarding campus issues and the stories in its pages. Letters accepted for publication may be edited for clarity or space, and may not necessarily reflect the views of San José State.